Chris Douglas, aka Dylan Moody on "One Life to Live," lays out a smorgasbord on the Alaskan tundra, retreating into a cube of thick Plexiglass and sealing the lid with a series of steel latches. Salmon, apples, muffins, hot dogs, trail mix, Rice Crispy Treats--artfully arranged on rough-hewn slabs of wood, as if our rugged Mr. Douglas moonlights as both lumberjack and sushi chef. The purpose? To discern the gustatory preferences of Stephen Colbert's nemesis, the Bear. 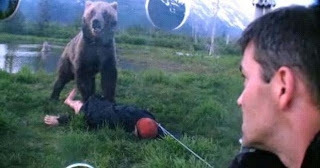 Comfy in his "predator shield," Douglas waits barely an hour before he's surrounded by three grizzlies: two females and an 800 pound male with a massive shoulder hump, that mound of fat and muscle which gives a grizzly swipe the force of a mack truck. We are told the grizzly's sense of smell exceeds that of all other apex predators. As such, we are led to believe that this olfactory dinner call has lured bears from clear across the tundra to abandon their salmon-choked rivers and solitary berry gathering in favor of an easy, intimate dinner. I thought females were wary of adult males. I sure am, be they ursine or hominid. Apparently, I know nothing, for Mr. Douglas's furry menagerie carouse like old friends. The apple is sampled, then quickly abandoned for salmon. Sugar charged Rice Crispies and muffins follow in quick succession. Last on the list? Trail mix. And rocks it. I mean, really rocks it, like a cradle. If he weren't so darn scary, that bear would be cute. Douglas says the bear can roll the predator shield like dice at a craps table. Sadly, the bear is not a gambler. So why am I grizzled? "Most of the animals that have a permanent home at AWCC have been orphaned or injured. Due to the current protocols of Alaska Department of Fish and Game, these animals are not eligible to be released back into the wild. The Alaska Wildlife Conservation Center provides a permanent home for these animals." Aaaah, so that's how Douglas managed to skirt federal laws prohibiting the feeding of wildlife. And that's why animal experts are so miffed--under the guise of being a "documentary" featured on the Discovery Channel (and Animal Planet), Mr. Douglas has misrepresented the behavior of bears. Nevermind the scene where he stakes Billy the Dummy outside his acrylic hamster ball, mimicking an unsuspecting, sleeping hunter or fisherman. 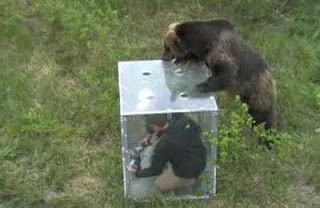 The inquisitive bears quickly investigate, and Mr. Douglas tests his bear deterrence call by shouting, "Hey bear! Hey bear!" As in "Hey bear! I'm stupid!" The fashion conscious bears immediately strip Billy of his 501s and run off into the brush with their denim treasure (to check for ID and credit cards, I assume). Billy's shirt goes next, like a nightmare episode of TLC's What Not to Wear. Finally, poor Billy himself is dragged away and mauled and mutilated. But Mr. Douglas doesn't stop there, oh no. Nothing is too good for his bears, so he offers them a dome tent and a van, as if he's running a training camp for misbehaving bears. Let's just mess up these intelligent, adaptive creatures and teach them to associate people with food. Or vintage jeans. This episodes stinks like the situation we faced in Hawaii concerning entrepreneurs feeding sharks on diving adventure tours. "We're educating the public...we're not teaching sharks to associate food with people...it's safe..." After an early ban on the practice was implemented, they skirted the law by taking their boats just beyond the 3 mile state limit, where they could clearly be seen from the beach. Thankfully, we (as well as Florida and California) have extended the ban on shark feeding to waters within 200 miles from shore. So let's put an end to Stupid Human Tricks. 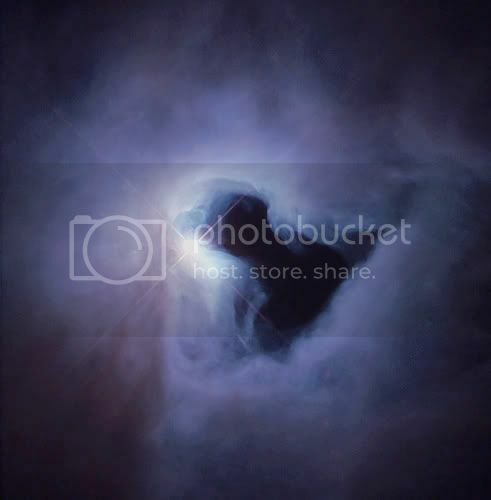 NASA Hubble Telescope views of a space phenomenon called a light echo. 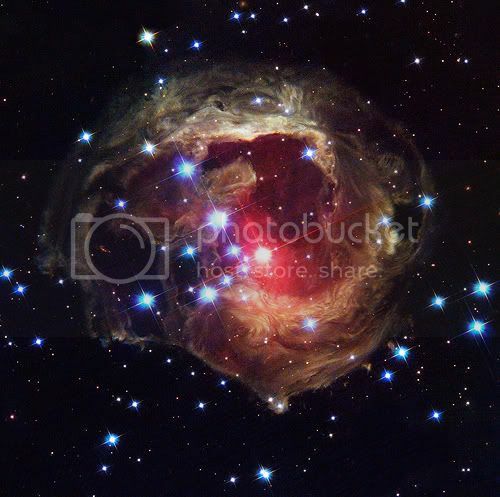 Light from a star that erupted nearly 5 years ago continues propagating outward through a cloud of dust surrounding the star. The light reflects or "echoes" off the dust and then travels to Earth. 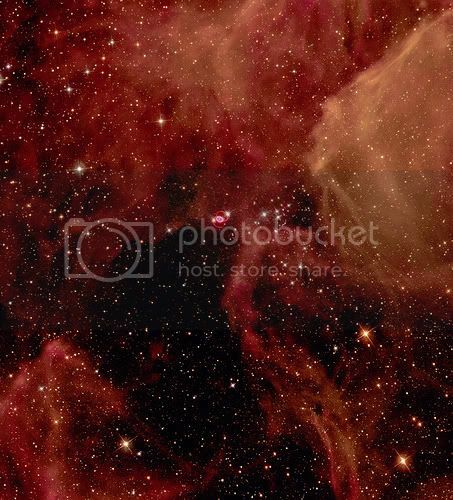 Eta Carinae is highly unstable and prone to violent outbursts. 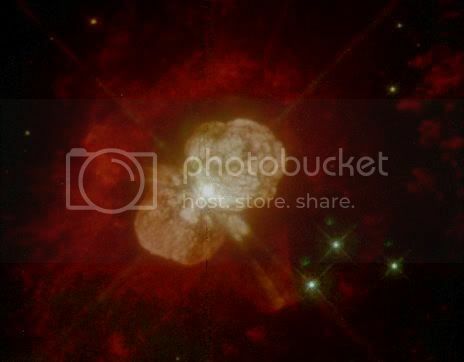 The last of these occurred in 1841, when despite being over 10,000 light years away, Eta Carinae briefly became the second brightest star in the sky. Appearing like a winged fairy-tale creature poised on a pedestal, the Eagle Nebula is actually a billowing tower of cold gas and dust rising from a stellar nursery. The soaring tower is 9.5 light-years or about 90 trillion km high, about twice the distance from our Sun to the next nearest star.